I have yet to make the 4 cards using our September Bloom Box but I've been making cards using the pieces of backgrounds I made with our Gel Press (which is on sale until Sept. 30). This card didn't quite turn out as I had envisioned and I'm not real happy with it. What do you think? If you look closely at the background you can just see this sunflower on it. I used Summer Days ink and brayered it on my Gel Press. I then took the stamp and stamped it dry on the Press. 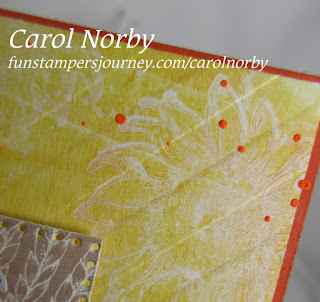 Next I stamped the stamp on a piece of scrap paper then stamped again on the Gel Press. I did this quite a few times. I was basically pulling ink off the Press and got reverse images when I applied then pulled my Whip Cream card stock. Next I embossed the piece with our Love Stripes embossing folder then flicked with some Citrus Cooler Silk. 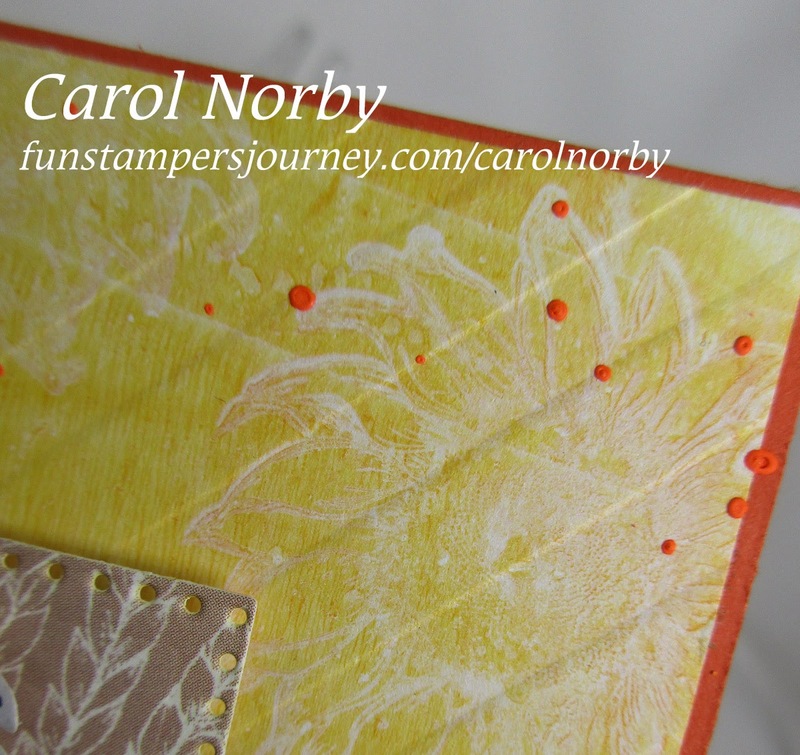 I layered this on Tangerine Fusion card stock and made 3 banner strips to layer my focal image over. 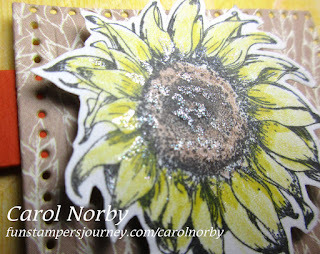 I stamped my small sunflower on Whip Cream card stock using Black Licorice ink and colored with our Color Splash Pencils and a small Blending Brush. I Rectangle die cut a piece of the Wheat pattern paper from the Fall Fest Collection. I adhered the banner strips directly to the back of the Wheat rectangle then used Foam Squares to adhere to the background. After detail cutting the sunflower I used Foam Squares to adhere it to the Wheat paper. 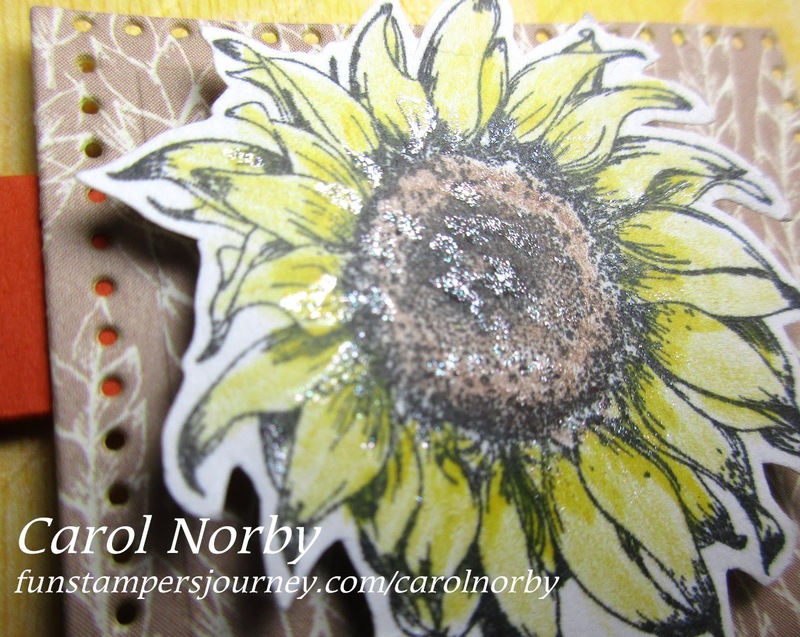 Can you see some sparkle on the sunflower? I again used my small Blending Brush to carefully apply some Sparkle Silk where I wanted it. 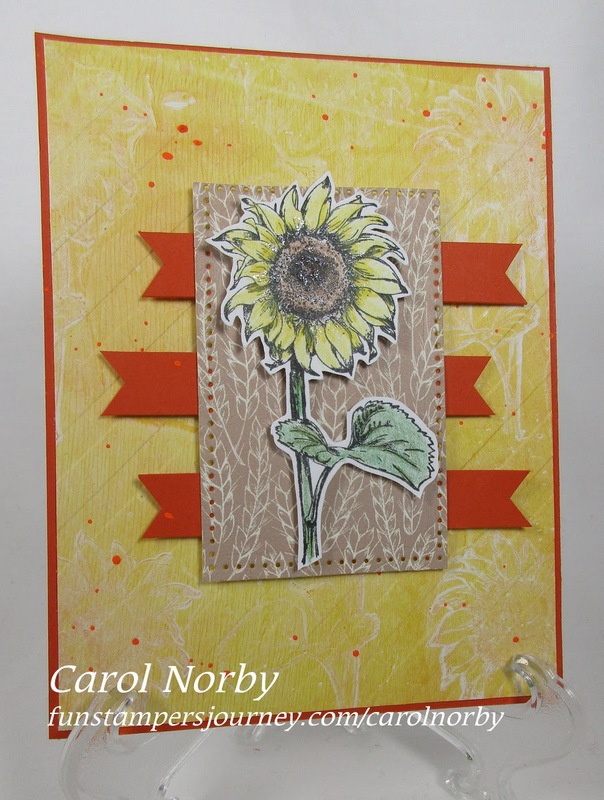 I like the yellow background with the ghostlike sunflowers. I don't like the brown piece. I do like the orange strips but might have liked them more towards the bottom, maybe cut at different lengths to imply a pot or basket. We are our own worst critics! I think this is great. 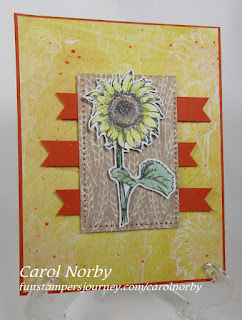 I love the sunflower and all the texture and stamping in the background!